One of the stories that I vividly remember from my days working for The Oregonian was a meeting that Oregon Sea Grant agent Bob Jacobsen set up with four of Newport’s older fishermen. One of them was Gordon White and he had me enthralled, talking about trawling in the 1940s, heading out of Newport with just a depth finder to help them find fish. There weren’t coastal cities then, there were coastal towns, small towns, and on the ocean in the dark, there weren’t many lights to guide them back home. Gordon White was one of the first fishermen to deliver a fish that he called rosies, or rosefish, a species I knew as Pacific Ocean Perch, or POP. The proper name is Sebastes alutus, and it is the current focus of my research and next book (check The Redfish Project entry under research projects for more information,https://carmelfinley.wordpress.com/research-projects/). World War II had been a good period for American fishermen. The military signed contacts to buy most of the fish, providing something fishermen had always lacked—a secure market at a fixed price. But with the end of the war, it was back to the uncertainty of the fresh fish market. In 1946, White, fishing a little deeper than usual, in 90 fathoms, found good catches of a small red rockfish. The market increased slowly, with a million pounds landed at Newport in 1949. But that October, the U.S. Food and Drug Administration seized a shipment of Newport fish and brought a libel action against the company for labeling fillets as ocean perch. East coast fishing companies objected to calling the rockfish a perch. Times were tight for the New England fishing industry. Since the 1930s, they had been plagued by fillets imported from Canada, where fishermen were paid less. Now there were imports from Iceland and Norway. 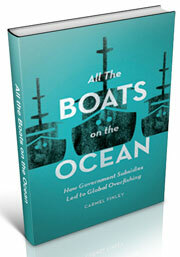 State Department documents during this period show that fish was a tool used to advance foreign policy goals. American loans financed new, modern processing plants and refrigeration facilities in Iceland. If Americans bought Norwegian fish, that was fish not sold into the Soviet Union, weakening a centuries old trade bond between Norway and Russia. With the New England fleet pushed out of its market, it expanded domestically, undercutting the markets created by West coast fishing companies. More trouble was coming. Fishing was about to be dramatically transformed. The new era began in Aberdeen, Scotland, on a brisk March morning in 1954 when the Fairtry splashed down the marine ways at the John Lewis shipyard. 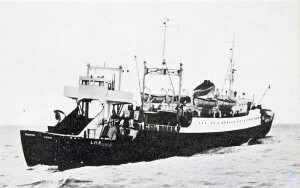 Owned by Christian Salvesen Ltd., the British and Norwegian whaling company, the ship had the stern ramp of a whale factory trawler, stainless steel Baader filleting machines from Germany, and multiple freezers from Birdseye, the American frozen food company. It was 280 feet long, cost $4 million and could fish in a force ten gale (winds of up to 63 miles an hour). Six years in development, the Fairtry brought together, for the first time, modern fish catching, processing, and freezing capacity, and it could stay at sea for weeks at a time. The first of two Soviet factory processing clones, the Pushkin and the Sverdlovsk, arrived off Newfoundland in 1956. Two dozen Pushkin-type factory ships were fishing in another two years. 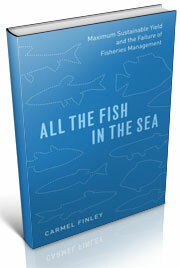 By 1958, new fisheries with enormous catches were being established from Maine to Greenland to the Barents Sea. 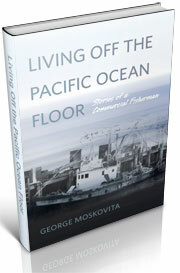 The huge ships appeared in the Pacific as well, first off Alaska, then off Oregon, where the boats targeted rosies. And soon there weren’t any roses around for the local fleet to catch. A fish that had supplied markets during the winter months, leading to hopes of full-time employment in the fish plants, was gone. And as White told the story, there was nothing fishermen could do about it for another decade, until the Fisheries Conservation and management Act of 1976, creating a 200-mile limit. And by that time, the rosies hadn’t come back. They still aren’t back, but that story can wait until a later posting. Includes a link to a picture of the launch. To read about the impact of factory trawlers on the New England fishery, read William Warner’s Distant Water: The Fate of the North Atlantic Fisherman, published by Little, Brown and Company in 1977. D.H. Cushing, The Provident Sea (Cambridge: Cambridge University Press, 1988), 234. Michael Harris, Lament for an Ocean: The Collapse of the Atlantic Cod Fisheries: A True Crime Story. (Toronto: McClelland & Stewart, Inc., 1998), 53. D. Cushing, The Provident Sea (Cambridge: Cambridge University Press, 1988), 235. Dayton Lee Alverson, “How high can perch climb?” Pacific Fisherman,October, 1954, 25. 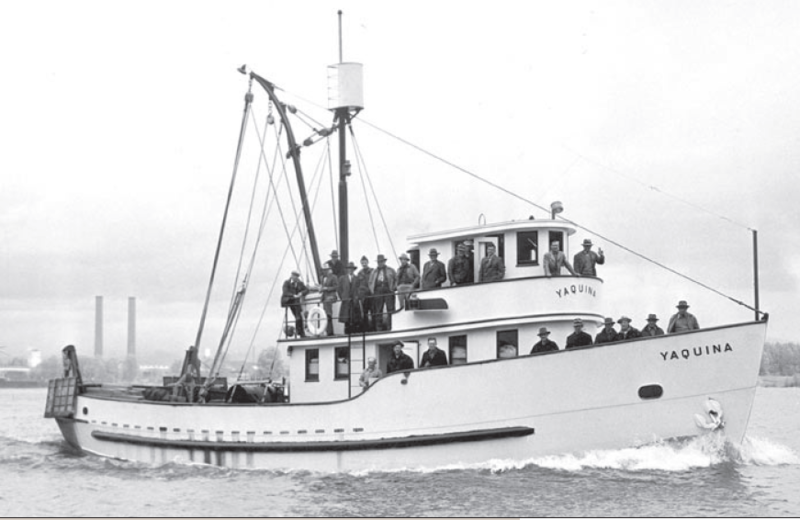 This entry was posted in boat building, Carmel Finley, Environmental History, Fishing, History of Science, History of Technology, Maritime History, Ocean fishing, Pacific Fishing History Project, Rosefish, Sebastes rockfish, Soviet environmental history, Soviet fishing, World History and tagged Captain Gordon White, F/V Yaquina, rosefish. Sebastes alutus. Bookmark the permalink.